VEER Magazine (which recently featured a great article about Virginia Beer Co.) has unveiled it's spectacular list of nominees for it's 2015 Golden Tap Awards! There are over 40 categories featuring beer styles, breweries, beer stores, and everything in between. The Virginia Beer Co. is thrilled to be included in the Collaboration category! Our Red Rye IPA collaboration brewed with Alewerks Brewing Company, Public Frenemy No. 1, is included in a delicious field of collab brews. Make sure to show your support for your favorites (we may be biased in one category) by voting early & often ahead of December's awards ceremony party at O'Connor Brewing Company! When Alewerks Brewing Company's Brewmaster, Geoff Logan, first approached us about doing a small batch collaboration beer, obviously, I was excited at the opportunity. It’s to the point that it’s cliché, but despite the inherent business competition, craft brewing really is a congenial and collaborative industry, and nobody exemplifies that more than Geoff. Geoff and I first started talking casually about what we might want to brew back in the spring, at the local homebrew club, CASK (Colonial Ale Smiths and Keggers), spring party. Conversation over a couple well-done homebrews led to discussing some of the newer hop varieties that have gone into production in recent years, specifically varieties coming from the American Dwarf Hop Association. Azacca is one of these hops, and will be featured heavily in The Virginia Beer Company's year-round IPA, so I have plenty of it contracted for the next few years. Geoff was interested in working with the new variety, so we had a bit of a direction for the collaboration, and we eventually settled on a Red Rye IPA as the base beer. Azacca is a great, high alpha acid variety, which also has great oil content giving intense aromas of tropical fruit- mango, pineapple and the like. The fruity character of the variety is almost overwhelming as a standalone hop, so we decided to balance it with some Simcoe for a little bit of dank, resiny, pine flavor and aroma. The brewday at Alewerks went quite well, and it was great to be back working in a brewery again after a year of pilot batching. The rye malt gives a nice crispness to the beer that allows the hops to really shine in the IPA. We also did all of our hop additions at the end of the boil and in the whirlpool, in order to keep the bitterness moderate for an IPA (around 65 IBUs) while still packing the wort with as much of the aromatic and flavorful hop oils as we could. The beer was then dry-hopped with copious amounts of Azacca to really pull out the tropical aromas of the hop- it seemed a fitting choice for a summer release. And with 2 lbs. of dry hops added per barrel (for 20 total lbs. ), those tropical aromas and flavors should shine like the summer sun! Speaking of the release, we’re excited to pour our collaboration Red Rye IPA alongside many of Alewerks’ other beers on Sunday, 8/2 at the Whistle Belly Virginia Beer & More Festival in Williamsburg, hosted by our friends at DoG Street Pub. It should be a great celebration of all things Williamsburg beer. And we're excited for the follow-up release at the Alewerks taproom on Thursday, 8/6 as part of the National IPA Day celebration. Cheers to collaboration and exciting new hop varieties! We here at The Virginia Beer Company are pretty stoked for Sunday's upcoming Whistle Belly festival here in Williamsburg. Beyond this shaping up to be an epic Virginia beer (and more!) event, it will also mark the debut of our second collaboration, and our very first in Virginia - a Red Rye IPA brewed with/at Alewerks Brewing Company! Our friends in the press have picked up on the story of Williamsburg's hometown brewery and Williamsburg's newest brewery coming together to celebrate craft beer in Williamsburg & Virginia. Read more about how this all came together, and join us on 8/2 to be some of the very first to try this new brew! "'We're excited and honored to debut the collected efforts of Geoff Logan and Jonathan Newman at Whistle Belly,' says Michael Claar, DoG Street Pub General Manager and Whistle Belly festival organizer. 'This is a long awaited peek at what's in store from The Virginia Beer Company, who has been building anticipation from this community for a while.'" "[Virginia Beer Co. Co-Founder Robby] Willey said Alewerks had been helpful and offered insights into the industry as Willey and co-founder Chris Smith prepare for a fall opening of the Virginia Beer Company. Willey said Red Rye IPA was a natural extension of that relationship." 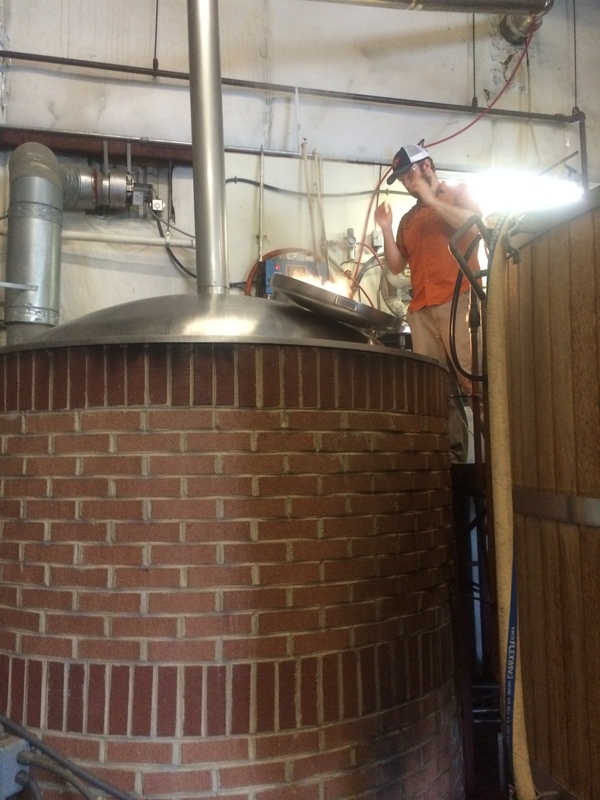 WILLIAMSBURG, Virginia – July 22nd, 2015 – Alewerks Brewing Company and The Virginia Beer Company are collaborating on a new beer set to premiere at the upcoming Whistle Belly festival on Sunday, August 2, 2015. Alewerks Brewing Company is Williamsburg’s hometown brewery, having been in operation since 2006. The Virginia Beer Company is the newest addition to the local craft beer community with plans to open in the Fall of this year. "The Virginia Beer Company team has the ability to produce a fantastic product, the desire to promote area businesses, and above all, the passion to celebrate the amazing craft beer scene in Williamsburg,” says Robby Willey, one of The Virginia Beer Company’s Co-Founders. “What better way to do all of the above than by combining forces with Alewerks Brewing Company and unveiling our shared vision at the premier local celebration of food & Virginia beer, DoG Street Pub's Whistle Belly!" With plans to debut a brand new Red Rye IPA at the upcoming food and beer festival, the two companies have been busy with the brewing process. "Alewerks Brewing Company is proud to partner with The Virginia Beer Company to produce a beer in celebration of Williamsburg's burgeoning craft beer scene. Our collaborative Red Rye IPA will debut at DoG Street Pub's Whistle Belly on August 2, and will be available locally thereafter. This unique IPA is built on a foundation of spicy rye, luscious crystal, pale, and a touch of roasted malt, while also featuring one of the brewing industry's newer hop varietals, named ‘Azacca’. Expect this hop to bring notes of mango, papaya, pineapple and citrus to the beer's overall flavor and aroma profile,” says Geoff Logan, Brewmaster at Alewerks Brewing Company. “At Alewerks, we welcome our new brewing brethren to the local craft beer scene and are excited about working together for many years to come!" This new craft beer will debut at the upcoming Whistle Belly festival, then premiere on National IPA Day in the Alewerks Brewing Company taproom on August 6. Tickets for Whistle Belly are available online at whistlebelly.com and information on the National IPA Day release is available at alewerks.com and virginiabeerco.com. Whistle Belly is presented by the Junior Woman's Club of Williamsburg who will use all proceeds as grants and scholarships for local charities and students. Pictured (from left to right): Geoff Logan, Brewmaster, Alewerks Brewing Company; Robby Willey, Co-Founder, The Virginia Beer Company; Jonathan Newman, Brewmaster, The Virginia Beer Company; and Chris Smith, Co-Founder, The Virginia Beer Company.